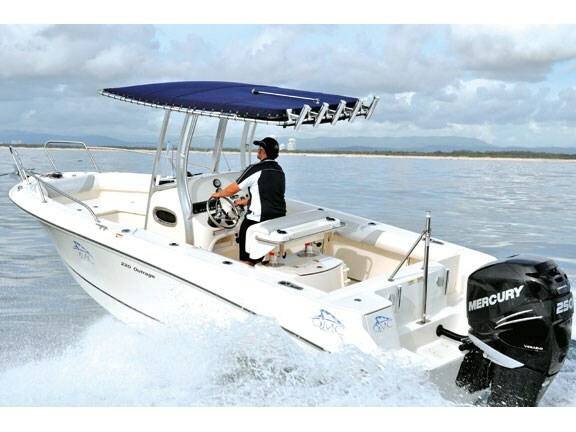 American brand Boston Whaler has a long-established history of producing tough and dependable boats. Its 220 Outrage centre console will only further that reputation. Boston Whaler is a brand that most avid boaters know, and one that produces the kind of boat that every keen fisho probably dreams of owning. So what is it that really makes Boston Whaler and its products so special? 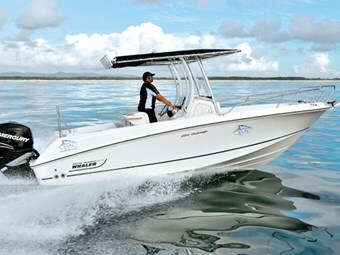 Underlying the longevity of Boston Whaler’s boats is the superb build quality. The Whalers have a Unibond construction that sandwiches high-density, non-absorbent foam between two walls of fibreglass. But instead of just having a foam-filled hull, Boston Whalers are foam-filled throughout, which makes them, as the builder itself puts it, "the unsinkable legend". No wonder this boat has a maximum capacity rating of 10 people. This construction style also means the boat’s ride is significantly quieter. When you climb into the 220 Outrage you’ll soon recognise its strategically planned fishing/family boat format. The stern section is nice and compact, but there is good room for fishing here around the motor. The designers have managed to fit in a retractable fold-away lounge seat, with a sturdy stainless steel hinge system. The Outrage’s gunwales feature rod racks instead of the usual built-in side pockets. The gunwales are at a comfortable height too, and include generous coaming bolsters, flush stainless steel rod holders, full-length stainless steel toe-rails and even downrigger weight holders. Kill tanks or hatches are oversized; in fact you could store a few monstrous fish here. On top of that, all the hatches can serve as chilly bin-type coolers thanks to the foam filling found throughout the craft. The console set-up is neat and complemented by a slim-line, quality T-top with rocket launchers. The Whaler’s T-top is anything but bulky – through careful design it has been kept quite aerodynamic and flush against the console. 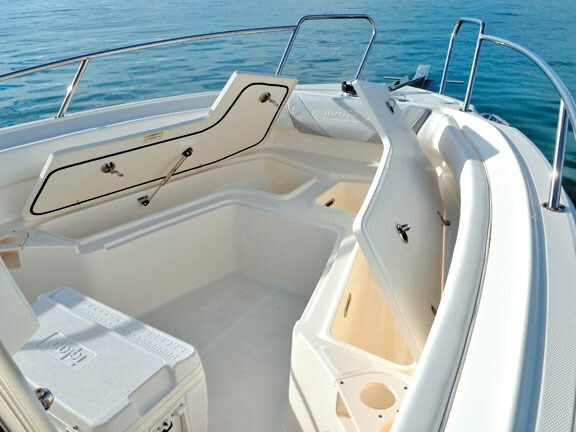 The console itself is wide but not so bulky that it hinders movement around the boat. It has ample space for larger electronics, an oversized clear screen and a side entrance to a Porta Potti. 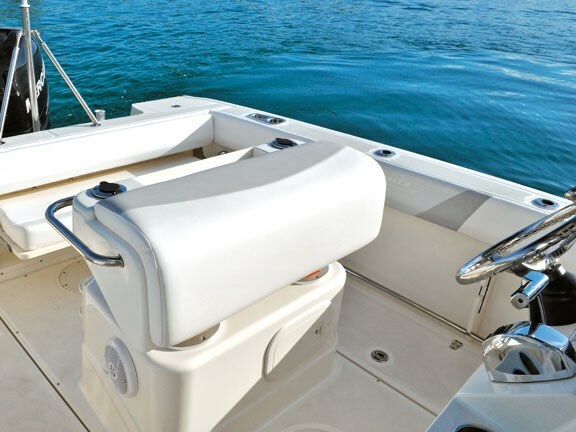 Instead of seating, the 220 Outrage has a bolstered backrest that works well when at the helm, although personally I’d prefer a seating option. On the reverse side there’s a colossal livewell and utensil holder, plus a stainless steel wrap-around grab-rail. Up in the bow there’s comfy wrap-around seating with plenty of stowage space beneath. This kind of seating might take up a bit of fishing room, but it’s great when you’re entertaining on the water. I was expecting a violent eruption from the 250hp Mercury Verado, but being propped the way it was, the holeshot was far from aggressive. Nonetheless, it was still quick onto the plane and once you knocked the hammer down, all hell broke loose. Once up and running, all it needs is a light tap on the throttle to crank things up to serious speed, and the beauty here is that the hull can handle it. I found a comfortable and economical cruise speed was around 26-30kts (48-55km/h) in all directions to the swell and chop, and, if you were prepared to hang on, the hull could handle speeds far beyond that. In flat water at WOT (wide open throttle) we managed 40kts (74km/h) at 6000rpm. The 220 Outrage’s ride is notably dry. The sponson and reverse-chine design definitely does a good job of deflecting spray down and back. 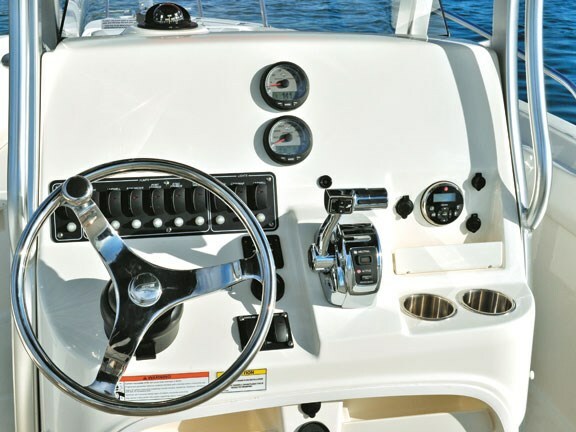 The recessed electric trim tabs – a standard feature – also play a significant role. Any monohull can benefit from tabs, and if you know how to set them correctly, you can adjust the ride to suit the conditions. For a centre console the 220 Outrage’s handling and performance is impressive, and this gives you the confidence to venture further offshore without having to worry about the run home if conditions turn ugly. If you’re an enthusiastic offshore fisherman who’s picky about design, finish and attention to detail, then add this boat to your wish list. 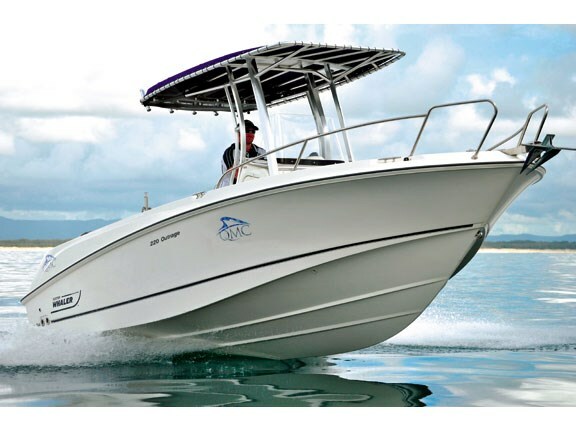 When it comes to standard fittings, the Boston Whaler 220 Outrage has it all, and more. Taking all those bells, whistles and bling into account, it’s not badly priced, either. Still, it’s not about the total list of what’s on offer here, but rather the quality and finish of each and every item. For more information contact Sports Marine Auckland or Sports Marine Christchurch, or check out Boston Whaler boats for sale here.